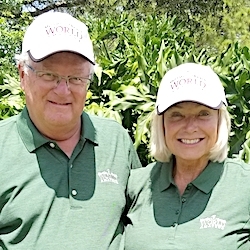 Rarely, if ever, have Illinois golfers made as big an impression at the Western Amateur as they did last week in the 112th staging of the prestigious tournament at Chicago’s Beverly Country Club. Doug Ghim, of Arlington Heights, tied the course record with a 63 in stroke play qualifying and was the tourney’s medalist – the first Chicago player to earn that honor since Roy Biancalana in 1983. 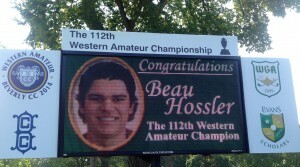 The scoreboard beside Beverly’s 18th green said it all after the 112th Western Amateur. Three University of Illinois golfers survived the 156-player stroke play portion of the tournament to make the Sweet 16 for the match play segment and two were still playing in Saturday’s climax to the event. None of them, however, could get the ultimate prize. 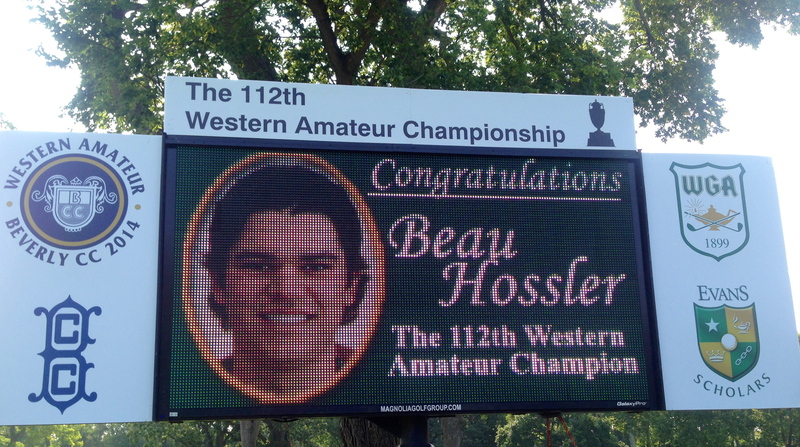 The title went to Beau Hossler, a University of Texas sophomore from Mission Viejo, Calif.
Hossler knocked off Ghim, who will be his teammate at Texas when classes begin in the fall, in the Round of 16 on Friday. On Saturday morning he eliminated Northbrook’s Nick Hardy 4 and 3 in the morning semifinals before dispatching another Californian, Xander (CORRECT) Schauffele, 2-up in the afternoon final. 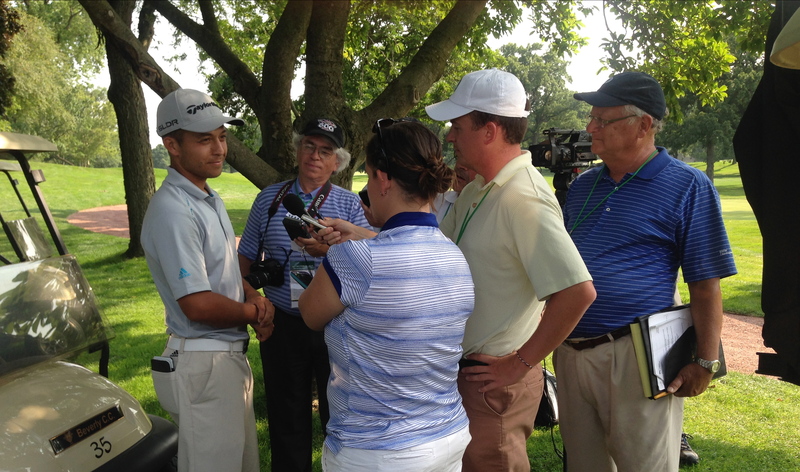 Schauffele, a senior at San Diego State, was also a spoiler for the Illinois contingent. He was a 1-up winner over Brian Campbell, Illinois’ No. 1 player, in the other semifinal. Campbell and Hardy, who graduated from Glenbrook North and will soon be an Illinois freshman, were poised to make it an all-Illini final but both came up short. 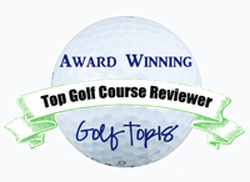 To the winner goes the George R. Thorne Trophy. Thorne was the Western Golf Association’s first treasurer in 1899. 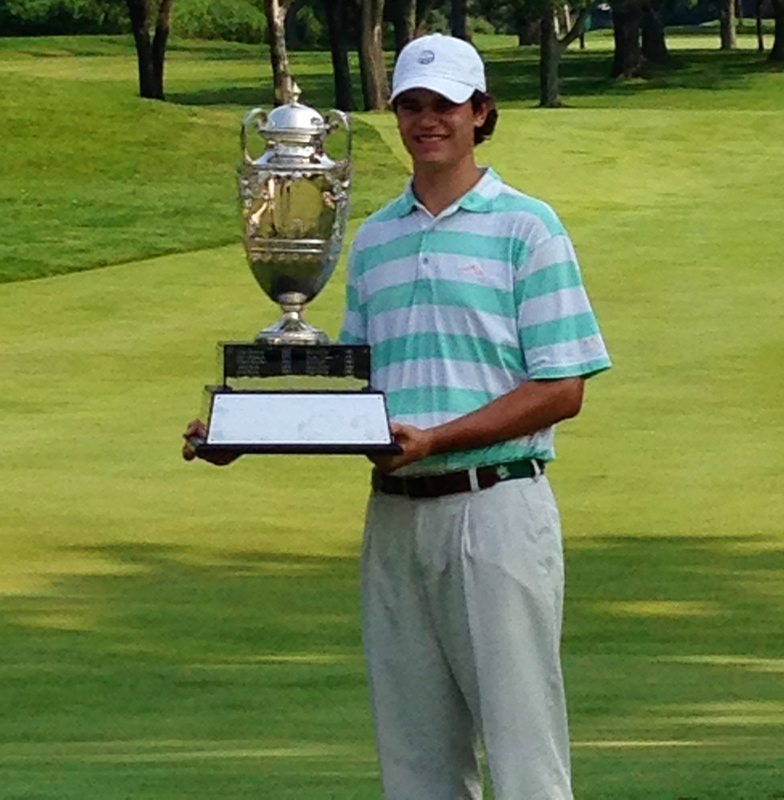 Hardy, runner-up in both the Western Junior and Illinois State Amateur this summer, didn’t need to play beyond the 14th hole in his first two matches, but he was no match for Hossler after going 4-down after seven holes. Campbell pushed Schauffele harder, and that may have impacted the title match. In that one Schauffele went 3-up twice before Hossler mounted a comeback on the back nine. The match was all square going to No. 17, a 229-yard par-3 that features a green that slopes steeply back to front. Hossler hit to the front of the green, leaving himself a 30-foot uphill putt. Schauffele took the more aggressive route, hitting a 5-iron that took a big bounce and wound up 15 feet past the hole on the back fringe. Hossler’s fine lag putt assured par and Schauffele chunked his first chip as a cellular radio nearby sounded, leaving him a third shot from nearly the same spot. Schauffele’s long par putt rolled well past the hole, giving Hossler the lead going to the 18th. He played the 559-yard par-5 solidly, hitting his third shot to four feet below the cup. Schauffele’s drive went far left, leaving him an awkward stance in the rough that necessitated a second shot down an adjoining fairway. When his fourth dropped into a bunker he conceded the hole and match to Hossler.